South Florida Walmart shelves are empty as shoppers flock to stores. Eugene Johnson purchased two loaves of bread and batteries for his flashlight. Those are his supplies in preparation for Hurricane Irma. In his kitchen cabinet he already had a few cans of tuna and he plans to boils some eggs. 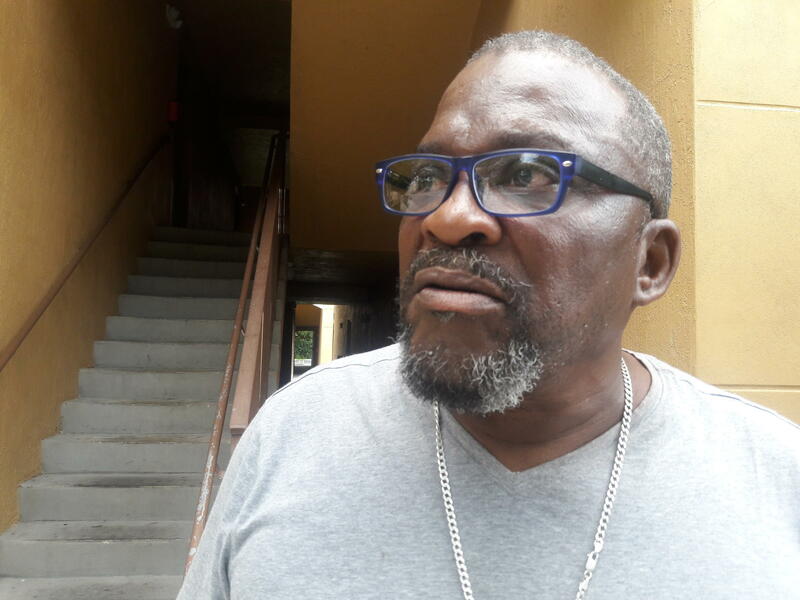 Johnson, 65, lives in an affordable housing complex in Miami and, like many of his neighbors who are also on fixed or limited income, he doesn’t own a car. “I have to depend on other people to bring me water so I have a friend who said they gonna bring me some water,” he said. While local news broadcasts have been dominated by images of people flocking to stores all week to stock up on water, nonperishable food and supplies to ride out Hurricane Irma, many families can’t afford to do that. Eugene Johnson says shopping for hurricane supplies is difficult on a fixed income and with no car. Income disparity is a serious concern in Miami-Dade where of the 3 million residents an estimated 530,320 live below the poverty line. On Wednesday, a small group of community activists and nonprofit employees got together to discuss this issue: poverty and hurricane preparation. “How can we get resources to help them before the storm?” asked Valencia Gunder, a community activist in Liberty City. “Are there any resources from larger institutions to help purchase these things?" But with just two to three days before Hurricane Irma is expected to make landfall—and at a time when most stores are already out of supplies—the group soon found themselves frustrated that there’s very little they can do to help potentially hundreds of families who might need assistance with hurricane preparations. “It’s way too late,” said Maggie Fernandez with the Miami Climate Alliance. Gunder sat back in her chair and put her head down. She said local institutions have failed the most vulnerable among us as a Category 5 hurricane barrels toward the state. Gunder said the working poor and people who rely only on social security are invisible in hurricane planning because there’s no one coordinated system to help people who lack the financial resources to buy hurricane supplies ahead of a storm. Mark Moore with City of Miami Emergency Operation Center said after major disasters, ideally people will be self sufficient for the first 72 hours. Families who can’t do that must wait and see when relief comes—and sometimes that can mean several days. After Hurricane Harvey devastated Houston last month, many families reported they were stranded with no food or water for days. Robinson Fenelon who grew in Miami’s Little Haiti neighborhood said his family could never really prepare during Hurricane warnings because they were too poor. This week the 25-year old realtor went out and bought a pallet of water cases and handed them out to dozens of families for free. He says one man made him emotional when he told him he didn’t have the money to buy enough supplies for himself and his children. “He said, 'You don’t understand how grateful I am,'” said Fenelon. “He showed me his account …negative $289." Fenelon wished he could do more. In the meantime, Eugene Johnson, who lives off of his Social Security check, is just hoping his supply of a few cans of tuna, the bread and the water a friend is supposed to bring him will help get him through the storm. The catastrophic Category 5 Hurricane Irma continues to batter the Caribbean and head towards South Florida and Miami-Dade County has issued voluntary evacuation orders for the City of Miami Beach and Zones A and B (you can find your zones here). According to the National Hurricane Center, Hurricane Irma's eye passed over the northernmost Virgin Islands this afternoon and hurricane watches could be issued in the Florida Keys and the mainland as soon as Thursday. Irma Begins Tearing Through The Caribbean - But Will Its Path Limit Destruction? While South Florida watches Hurricane Irma’s dangerous approach, the record storm already began tearing through the Caribbean Wednesday morning. But Irma’s path across the basin could help limit its destruction there. The first to feel Irma’s fierce Category 5 winds were the Leeward Islands in the eastern Caribbean. Gusts were clocked at 155 miles per hour at Antigua and Barbuda. Still, the storm’s center passed to the north, and officials said the island nation emerged better than expected. Many schools throughout South Florida will be closed at the end of this week because of concerns over looming Hurricane Irma. Officials caution that the hurricane's path is not yet certain, but they are emphasizing preparedness.